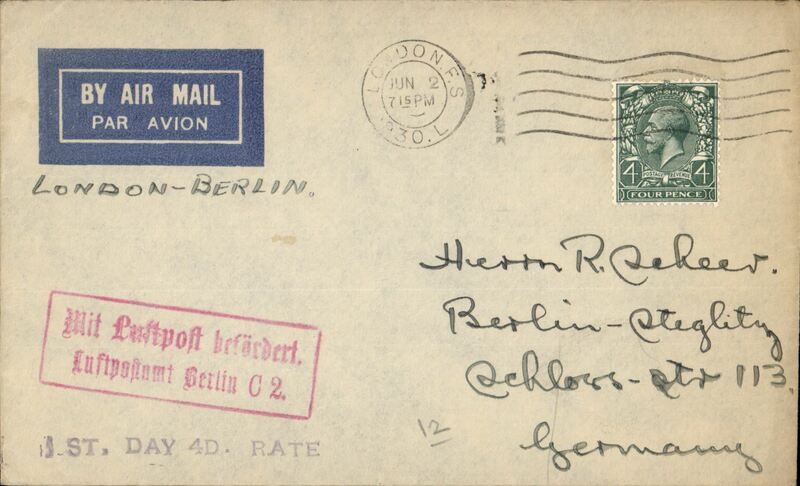 Description: Imperial Airways, London to Berlin, bs 3/6, first service at the new 4d per oz. rate, red framed 'Mit Luftpost befordert/Luftpostamt Berlin C2' receiver, plain imprint etiquette cover, Not easy to find. 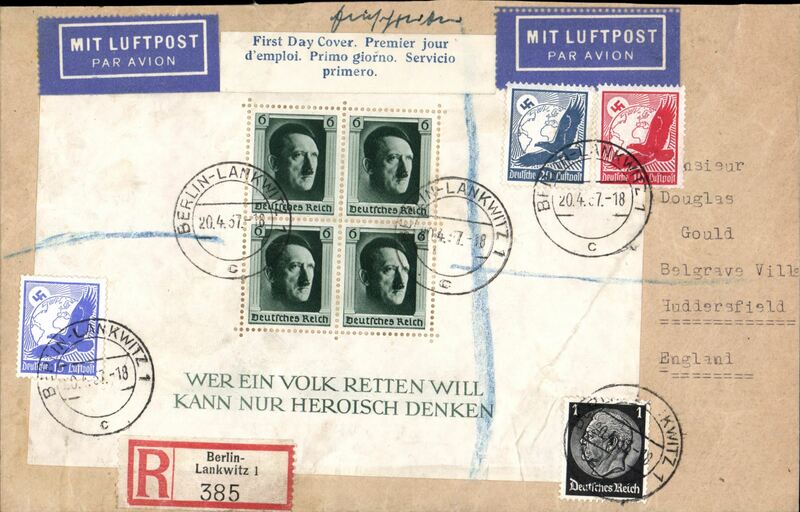 Description: Hitler's Birthday ms franking registered (label) airmail FDC with additional 45pf all canc Berlin-Lankwitz cds, flown to England, no arrival ds, blue/white airmaikl etiquette. 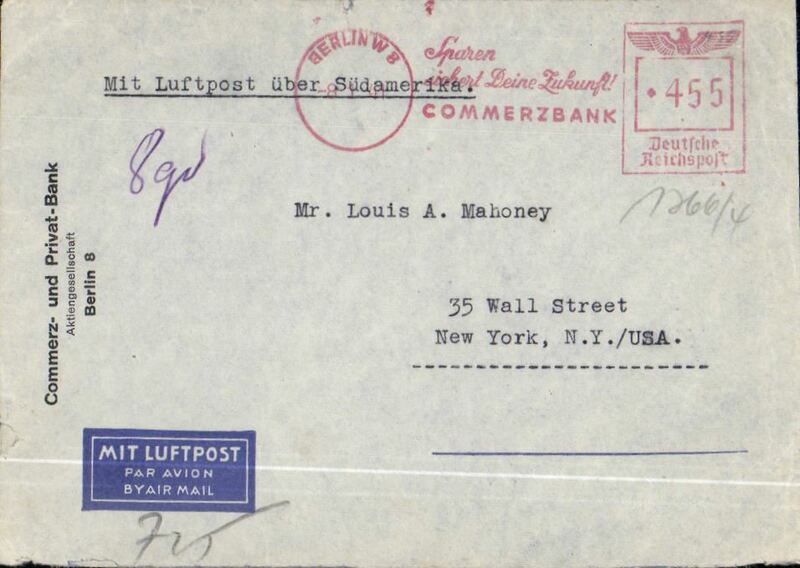 Description: Germany to USA, flown by LATI, rare double rate censored WWII imprint etiquette airmail cover, Berlin to New York, uncommon red Berlin 8 1 41 455rpf machine cancel, typed "Mit Luftpost uber Sudamerika", ms "8g", sealed black/white German OKW censor tape, code e Frankfurt, also small German framed number censor marks. Correctly rated 450rpf for double rate Germany to USA via LATI (2x 215rpf air fee + 25rpf basic, see Beith p38). Flown Rome to Brazil by LATI, FAM 6 to Buenos Aires, then Panagra Pacific coast route to USA (see ?Pacific route endorsement below etiquette) and on to Cristobal for exchange of airlines, FAM 8 to Brownsville, then CAM 22 and internal airline to final destination. An expensive, but effective, method of sending Axis airmail to USA to avoid British censorship in Bermuda (FAM 18) and Jamaica (FAM 5). A superb exhibit item in particularly fine condition.